Sobipro Nearby Entries is a Joomla module that easily displays the nearest places (entries) in relation to the SobiPro entry you are currently browsing. The nearby places to be shown can come from the same Sobipro section as the active entry or from a different section. 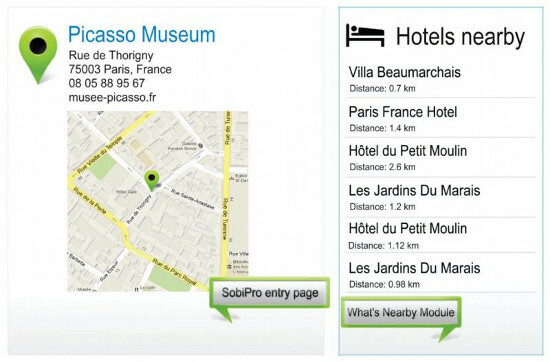 For example if the current entry is a museum page, using the “Sobipro Nearby Entries Module” you are able to show hotels in neighbourhood or other accommodation entries located near the current museum. Based on the parameters set in the backend module administration interface, when the visitors access the details view of a SobiPro entry, the module will display a list of entries which are located in the vicinity of the active entry. - Works great! I have installed it and configured fast and easy.